September 2018 is over. It is time to announce the winner of the September 2018 Street Photography Contest! 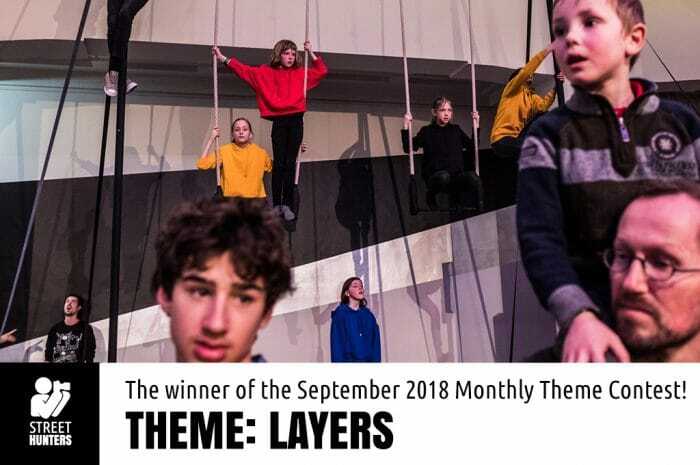 The theme of the contest was “Layers” and we had asked you all to send in photos with examples of street photos made with the layers composition technique. You responded by sending in loads of photographs! Thank you all for submitting your awesome work! As per the rules of the contest, Street Hunters Andrew Sweigart, Digby Fullam, John Hughes and myself, chose one photo each. The next step was to select the very best one of the four and present it here to you. So, the lucky winner of the September 2018 Street Photography Contest is Bojan Nikolic and this is his photograph. So, many congratulations Bojan Nikolic for winning our contest! Your photo was chosen as the best out of 20 valid submissions. Well done! Unfortunately we do not know any more about Bojan Nikolic or his work because no links were provided with his submission. So if you are reading this Bojan, please send us links to your work. The winning photo will be featured as the Street Hunters Cover photo in all our Social Media channels during October 2018. His work will be featured on our website and on our Youtube channel. 50-80 of your best photos so we can create a slide show presentation of your work that will be displayed on our YouTube Channel. You can use a services such as WeTransfer to send the photos. Long side of your photos must be at least 1920px. Thank you & congratulations once more!